In life, not everything works out as you had planned. Probably most things don't work out that way. This is also the case with organizations and with projects, and it is also true with NISO. I know it might come as a surprise to learn that not every project within NISO is destined for success. There are a variety of reasons why things don't work out. Perhaps an educational event is organized in an inconvenient place or conflicts with a different event, or say you plan a presentation and a huge news event prevents participation. Some errors are simply bad assumptions; others are just bad luck and beyond your control. You can't always put yourself in someone else's shoes, so you may miss a particular detail or perspective on a problem. There are also problems that grow slowly from faulty reads on the situation at the outset, or presumptions about the environment that shift over time and overwhelm the effort in its later stages. Furthermore, there is the ever-present Rumsfeld aphorism, "there are unknown unknowns," which is to say that things we don't know can cause failure, and we may never know why. While not every project NISO has launched or pursued has been a success, fortunately, we've had more successes than failures! Happily, each year during our annual meeting, I have the opportunity to talk about what has gone well, how quickly working groups have progressed, and all the new members NISO has gained. Who doesn't like to talk about their successes? Sometimes, however, projects or efforts go unnoticed because they simply aren't advanced and they peter out. Others slowly grind to a halt because of competing priorities or limited interest. Still others are completed but don't see the adoption we were hoping for. Knowing when to set aside a project and move on is more art than science. Understanding in advance what will work and what won't is probably a dark art. In the technology world, knowing how to fail, understanding how to move on or "pivot," are important compentencies. During a panel discussion I participated in at the Library Publishing Coalition forum in Baltimore on March 20-22, 2017, Angela Cochran talked about the skill necessary to kill off a project and how it is lacking in our community. People often don't like looking at in detail at the reasons for something not working out. On the other hand, sometimes they wallow in their mistakes. Perhaps this is why projects that should be put to bed still linger. I am pleased that NISO generally looks at why some things aren't working and accepts the demise of projects. But a deeper problem has to do with organizations with limited resources focusing on failing efforts, possibly diverting resources from projects that could have greater impact. It's worth remembering, though, that even failure has the upside of being a learning opportunity. I take my cue in this from astrophysicist Neil deGrasse Tyson. When the host of radio show "Wait, Wait...Don't Tell Me!" told Tyson he lost because he got two questions wrong, the scientist said, "I look at it differently. I look at had I gotten all three right...I would've learned nothing. But having gotten two wrong, I learned two things today." I hope we all learn quickly and apply what we have learned! The objective of this session is to gather input from consultants, content and technology providers as to their perspective on emerging technologies that might transform (or at least enhance) the presentation and delivery of information to researchers and scholars. What visions do they have for enhancing information environments and resources? What possibilities get them excited? What "Next Big Thing" do they see? It may be on the fringes now, but it might just as easily go viral! All speaker abstracts are now available and registration is open. The 21st-century educational environment demands a certain amount of re-thinking and re-design of classroom support for learning, in terms of textbooks, information resources, and interactive courseware. An emphasis on cost-containment and accessibility suggests that education will become more open. This virtual conference will address the complexities of delivering instructional tools and digital resources in the increasingly open educational ecosystem. What is a textbook? Is it engineered into an online learning environment, with content, study aids and quizzes delivered as appropriate to a personalized student experience? What is the long-term role of Open CourseWare, as created by the likes of MIT or Yale? What does a growing interest in OER suggest for the various stakeholders? What types of technological support may be necessary? Access to an associated NISO Training Thursday webinar on April 27 is included in your registration for this virtual conference. Standards have been traditionally delivered as PDF documents. Yet in a world where standards are increasingly monetized through derivative products, exchanged between partners, and consumed on mobile devices, PDF does not provide the flexibility needed to meet current and future market demands. The NISO is hosting this event for standards publishers as an aid to the understanding of how XML provides the key to solve all of these issues, improve publishing processes, and bring business value to the organization. Registration for this event has been capped. To be waitlisted, please contact Jill O'Neill directly at joneill@niso.org. This session will look at the on-going importance of mobile devices and the influence those devices have on access to and usage of various forms of content, whether text or multi-media. As a ubiquitous tool for a global population, the impact of mobile on the practices and policies of libraries and content providers should not be underestimated. The Web, as a publishing medium, is increasingly important. We live in an age when a publication or an app may not be a self-contained object or artifact, but rather a combination of browser functionality and HTML-formatted content. On the one hand, providers may be able to offer a more interactive and engaging reading experience than is currently possible with a static page. On the other hand, there are challenges in delivering that experience. Some genres (poetry, mathematical expressions, etc.) have highly specific requirements for placement, expression and rendering. How will content providers deliver that to the reader? What are the workflow considerations for production? For libraries -- both those with publishing responsibilities as well as collection or archiving responsibilities -- what new complexities are introduced for long-term preservation? For support of different devices? This six hour virtual conference will examine next steps in moving beyond what we think of as being the "printed page." NISO's Educational Programs Manager, Jill O'Neill, examines Facebook founder Mark Zuckerberg's recent manifesto, Building Global Community, in which Zuckerberg emphasizes the importance of information literacy. "The World Wide Web Consortium (W3C), the group that orchestrates the development of Web standards, has today published a Working Draft for Encrypted Media Extensions (EME), a framework that will allow the delivery of DRM-protected media through the browser without the use of plugins such as Flash or Silverlight," explains Bright, who goes on to outline vehement opposition to the framework by organizations such as the Electronic Frontier Foundation and the Free Software Foundation. "The National Historical Publications and Records Commission (NHPRC) and the Andrew W. Mellon Foundation invite proposals for Digital Edition Publishing Cooperatives. Working together, the Cooperatives will develop technical and human infrastructures to support the digital publication of documentary and scholarly editions and to provide for their long-term preservation, discovery, and use." The burgeoning area of digital humanities has a new outlet, as The Association of American Universities (AAU), Association of Research Libraries (ARL), and Association of American University Presses (AAUP) have announced an initiative to publish open access digital editions of monographs by humanities and humanistic social sciences faculty. H.R. 1695, The Register of Copyrights Selection and Accountability Act, would make the head of the U.S. Copyright Office a Presidential appointee. In a related press release, The Association of American Publishers (AAP) commends the idea, one for which the organization has long lobbied. Some library groups, meanwhile, oppose the change, with the Library Copyright Alliance referring to the plan as "mystifying." Digital Book World (DBW) took place in New York from January 17-19, 2017. The need for reliable data regarding publishing trends was a popular plea, and international players had a larger than ever presence. In roundups published after the event, Porter Anderson weighs in on opening-day themes and DBW's international fellows, Susan Lulgjuraj discusses Data Guy's views on print sales, and Futurdialog offers an overview of the show. Governmental surveillance of reading habits is nothing new, but in-depth commercial tracking of our literary habits has only recently become possible. What does it mean for reader privacy? Schema.org, the collaborative community that creates, maintains, and promotes schemas for structured web data, has released Schema.org 3.2. The organization explains that this update "brings many improvements including new vocabulary for describing courses, fact-check reviews , digital publishing accessibility, as well as a more thorough treatment of menus and a large number of pending proposals which are offered for early-access use, evaluation and improvement." The most recent edition of the Editeur Newsletter, published by the trade standards body for the global book, e-book and serials supply chains offered several items of interest to Newsline readers, such as coverage of new ONIX codelists and language updates and new national extensions to Thema. NISO Voting Members participate in the development, revision, and evaluation of standards. Voting Members are able to influence the standards process and mold the future of the industry. The following ballot is open and will close before the next newsletter is distributed. If you are a NISO Voting Member, log into your NISO page and you'll see the ballots linked there. ISOTC 46/SC 9WG 5, the Working Group that will conduct any revision of ISO 3297, Information and documentation - International standard serial number (ISSN), needs the permission of this committee to go ahead with a revision of the standard based on the results of the systematic review ballot. This ballot closes on April 7, 2017. 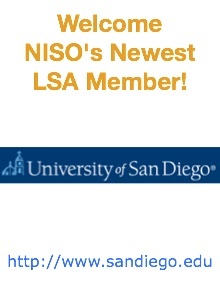 NISO's free monthly e-newsletter reports on the latest NISO news, highlights new specifications and standards of interest including calls for public review and comment, abstracts significant media stories on topics of interest to the NISO community, and links to news releases of NISO member organizations.